The annual Henley Club to Pub Swim took place in July with a record field of 625 swimmers who completed the 1.5km course on one of the hottest days of the year. Now in its fifth year, the Club to Pub Swim is firmly established on the calendar of summer events in Henley. 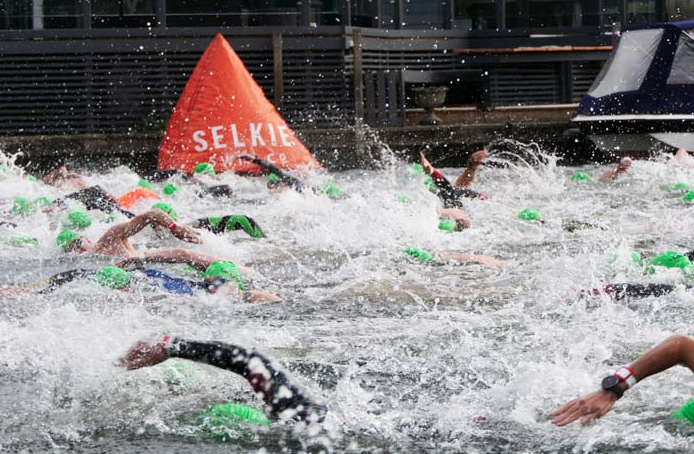 The swim has been supported by Brakspear since its start in 2014 and this year all swimmers were once again given a bottle of the specially-brewed Two Bells beer as they crossed the finish line, as well as a medal with a built-in bottle opener to ensure instant post-race refreshment. Swimmers and supporters again enjoyed a barbecue at the Angel on the Bridge, Brakspear’s riverside pub which is the finishing point for the race. All finishers were greeted at the pub by Mayor of Henley Glen Lambert as they emerged from the Thames. Top place in this year’s swim went to Antonio Almaraz Serrano, of Reading Swimming Club, who finished in a time of 18 minutes and 35 seconds, while the fastest woman home was Melanie Gibson, of north London, in 19 minutes and 47 seconds. “What better way to cool off at the end of a hot summer’s day than a swim in the Thames followed by a cold beer or two! It was great to see so many people enjoying Henley at its best, and our congratulations to everyone who completed the swim. Two Bells was also sold on draught in the Angel on the Bridge, with 10p per pint sold donated to Sue Ryder, the charity partner to Henley Swim.